My thinking cap has been working overtime over the past couple of weeks to come up with some gorgeous yummy recipes for the Royal Selangor 30-day Get Your Jelly On challenge. Today, as Wholesome Cook turns pink, I present you my first jelly creation, inspired by a childhood food memory: the strawberry, yoghurt and jelly trio. When I was a little girl we used to visit my Grandfather down south during the warm summer months. I remember climbing through to the back of his garden to find some of the juiciest and sweetest berries one could ever imagine. My face would be tickled pink, literally, from the goodness of the fruits found in the thorny wild raspberry bushes. Oh how I loved them! 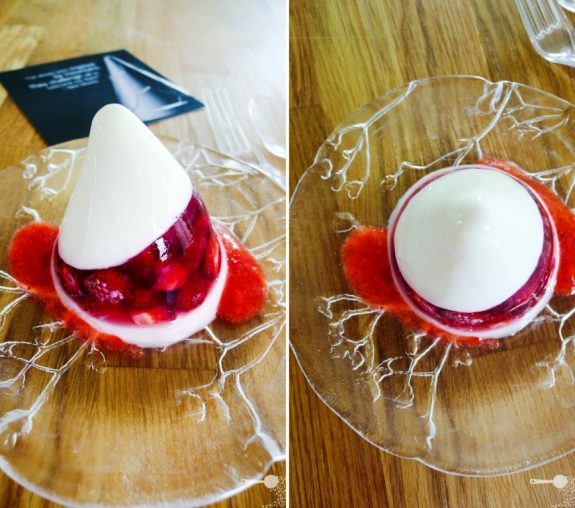 A small patisserie around the corner from his house used some of the local berries to make a funky blueberry and yoghurt jelly that was layered and set on an angle. Served in curvy glasses and topped with fresh whipped cream they were amazing and full of flavour from the fresh berries. Mum and I would often make replicas of the dessert at home. They always wowed the crowds. To make the creation more wholesome for the challenge, I used Jalna’s natural vanilla pot set yoghurt and Aeroplane Jelly’s Natural colours and flavours strawberry jelly crystals. It’s a recently released range which is naturally coloured and flavoured and also contains 25% less sugar than other jellies. The acidity of the yoghurt and fresh strawberries works a treat in this funky little dessert. And of course, I set my creation in the beautiful Royal Selangor jelly mould, which was inspired by mountains “they challenge us to overcome our fears”. I thought the white yoghurt ‘peak’ and the cherry blossom pattern on the plate reflect the concept of the mountain pretty well. Despite the 5 million clicks one of the participating bloggers has celebrated recently and 7,000 followers of another, this is a challenge for us too, albeit much smaller than the one some women (and men) face when fighting breast cancer, so please show your support by purchasing a mould and buying other Pink Ribbon products. Don’t forget, each comment on the Royal Selangor Get Your Jelly On challenge posts on my blog (Day 1, Day 2, etc) is your entry to win an Olympus VG-110 camera. Giveaway is open worldwide! Entries close October 30, midnight AEST. Winner will be announced on the blog on October 31. A delicious and refreshing layered jelly that is lightly sweet and wholesome. Inspired by the Royal Selangor jelly mould which itself was inspired by a mountain. You will need only 5 ingredients: vanilla yoghurt, fresh strawberries, strawberry jelly, gelatine, boiling water. Split as follows. To fill the mould for diagonal effect: place the jelly mould upside down into short wide openning jar or bowl, so that the mould is laying down on an angle rather than standing upright. To make the ‘peak’: place gelatine powder into a small bowl and add 2 tbsp of boiling hot water. Mix until dissolved and pour into vanilla yoghurt. Mix well with a spoon. Pour or spoon into the tip of the mould, making sure you don’t leave any spots or traces around. Wipe the spots clean if you have a mishap. Place in the fridge and allow to set for about 1 hour. To make the strawberry jelly: prepare strawberry jelly according to packet instructions, but add 100 – 150ml less water for a recommended 500 – 750ml final quantity respectively. Wash, hull and dice strawberries. Allow jelly to cool down at room temperature while you are waiting for the ‘peak’ to set. Once the ‘peak’ has set, place the mould into a mug so that it is not standing upright. Pour in 1/4 cup of strawberry jelly over the top and add strawberries. Place back in the fridge for about 1 hour or until set. To make the strawberry yoghurt jelly: puree strawberries, reserving about 1 tbsp for decoration later. Strain the remaining puree through a sieve into a small bowl, discarding the seeds. Add vanilla yoghurt and mix to combine. Place gelatine powder into a small bowl and add 2 tbsp of boiling hot water. Mix until dissolved and pour into strawberry yoghurt. Mix well with a spoon. Once the strawberry jelly layer is set, pour strawberry yoghurt and gelatine mixture over the top – keep the mould upright. Place back in the fridge an allow another 2-3 hours to set. To unmould and serve: place jelly mould into a cup of hot water for a few seconds. You will see the jelly melt around the edges a little – don’t let it melt too much though. If it’s a little stuck, you can run a knife along the edge to help it come out. Place a plate over the mould, flip the whole thing upside down (down side down – the plate should be on the bottom, the ‘peak’ facing up) and remove the mould. Serve with a couple of strawberry puree smears and enjoy! Wow! This looks amazing! I would have never thought of making yogurt jelly! Hey Marty! I’m so looking forward to seeing what other creations you come up with! This is addictive and the idea of this jelly mountain is very appealing. Very nice! I like how you offset the yogurt layer. Pretty. Thanks Nate, it’s really delicious too! Looking forward to seeing yours! It is beautiful! You have done an amazing job and it’s a really great post. Thanks muppy! Your comment made me very happy! WOW. That is one gorgeous and NEAT looking dessert!! Thanks! I love that it is NEAT despite being a little ‘to the left’. Love contrast of white and red in this one! So eye-catching. You definitely rose to the challenge! Looks awesome. Thanks Greg (and Katherine?)! I couldn’t sleep last night I was so excited! I picked up a punnet of strawberries at the market today and will be making this for my daughters’ dessert tonight. Fingers crossed it will set. What a wonderful idea. I hope your girls love it! Such a stunning looking dessert – will certainly give it a go! Your inspiration behind it is lovely – I’m hanging out for 30 more days! Eeverything is perfect in this dessert, flavours, texture, colour, and presentation on every angle. So inspiring I hope I can make one exactly like those. This is very creative indeed. All the best in the Jellirific challenge! it’s fun isn’t it but i wish the weather’s kinder. Marty that is stunning. I can’t wait for the next 29. I’m so glad I found your blog! 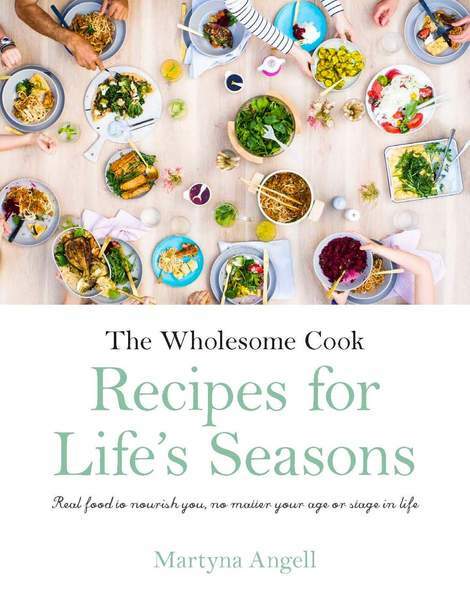 Very inspirational and delicious recipes! Oh great job! I love those diagonal lines. Very pretty indeed! Beautiful display, and I loved the “clean plate” at the end. Nice. Love the coulor contrast,texture and shine. Looks fabulous! The way it’s shaped at the top is pretty unique and strawberries are one of our fave fruits to cook with too. Great work!! Gosh, this is wonderful. Like the diagonal effect, reminds me of the court jester hat! It’s amazing how it reminds people of different things! Just saw your jello picture on Pinterest! Love the layers, they are gorgeous. And only 5 ingreidents that’s my kid of dessert! love the slant and the colours!!! making me salivate! My mom would love something like this. Oh wow, this looks absolutely delicious. I love the design as well. Yum! Strawberries are such a sweet treat! Wow! That looks amazing and cool! Thanks for sharing! A beautiful, creative and light dessert! It looks incredible! Oh lord that looks fantastic. Hello dear..Im checking out who is the participant of the Royal Selangor contest and I found your link..I was excited to know and find out what will the contestant do with the mould..wallah…not only you guys are so creative!! but your recipes also look delicious!!! Keep up the good work and GOOD LUCK! Love the strawberry yoghurt jelly, my grandmother used to make something like this – brings back memories. Your combinations are great! What an nice creation. It looks very inviting and delicious. What a gorgeous dessert! I love the last picture, too. I’m wondering what I have in my little kitchen that I could substitute for the great mold you have. Or…make it without a mold. Hmmm…I’d like to give it a shot, whatever I decide to do about a mold. It’s so striking and at the same time, sweetly simple. I love it! I love strawberries and yogurt. If you want to be more decadent, strawberries+creme fraiche+brown sugar = awesome. Wow, that looks so good! I just want to reach in and grab a piece. You’re making some BEAUTIFUL desserts! Actually just saw the camera winning link! sweet! I have never seen this before. It looks really pretty and tasty. I will have to make it soon. Thanks for sharing! The yoghurt top was denser and heavier than the support hence it ended up a little lob-sided… but it was sturdy! So glad I found your blog! This looks amazingly yummy. Very pretty but a little too complicated for me! Looks like a much healthier, upside down trifle. Always a winner. This looks so cute! Love the layers and the color to it. So pretty and it looks SO yummy! That’s possibly the most awesome-looking dessert I’ve ever seen. I’m definitely making this! How gorgeous! I love the swirl of colour through the middle 🙂 Makes me want simultaneously to dig a spoon in and not touch it to preserve it’s beauty, lol! I love yoghurt & strawberries! And it looks cool! This looks delicious…I love strawberries!